Arthritis, specifically Spinal Arthritis and Disc Disease (S.A.D.D) are common conditions that present to us in the clinic. During an audit of the x-rays taken in our clinic last year found that 17% had S.A.D.D present. Whilst it is often said in the that arthritis (also known as degenerative joint disease), is described by many as not a painful condition in itself, it can lead to pain, impaired or loss of joint function which can lead to a vulnerability to further injury and pathology1,2. It is a slow, progressive process that effects all joints of the body. The most common is Osteoarthritis, which is often referred to as “wear and tear”. 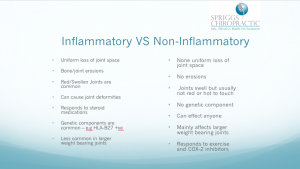 There are two main categories of arthritis: Inflammatory and Non-Inflammatory. Inflammatory types include: Rheumatoid Arthritis (RA), Psoriatic arthritis along others. These can be further divided into two additional categories including depositional arthritis, where crystals of calcium and uric acid are deposited within the joints, leading to joint erosion and inflammation. These include conditions such as Gout and Calcium Pyrophosphate Deposition Disease (CPPD). 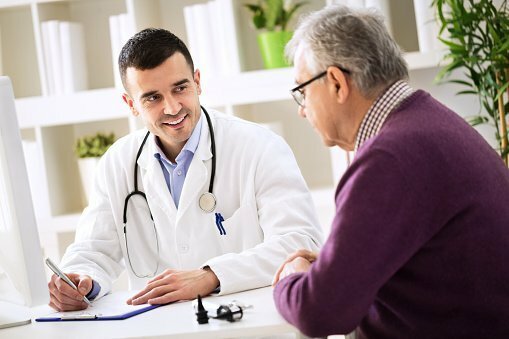 The other type of inflammatory, such as RA, are usually inherited genetic diseases that can be managed through pharmaceutical drugs and physical therapy, or they are the result of dietary and lifestyle factors that you may be susceptible to. None depositional, inflammatory arthritic conditions are caused by the patients own immune system attacking their joints, leading to joint pain and eventually deformity. These are usually symmetrical in their presentation (in both hands), whereas osteoarthritis, can be found in isolation, affecting one joint only. Depositional conditions, such as Gout for example, are cause by a build-up of uric acid crystal within your joints, ligaments and tendons. Uric acid is synthesised in the body when it breaks down purines found in our diets. Some people either naturally over produce uric acid during this process in their bodies, or they are unable to get uric acid out of their bodies, due to their kidneys not secreting it properly3. Therefore, diet and lifestyle modification is can be used in the management of gout3. All forms of arthritis are of concern for Chiropractic and manual therapists as they can create instability of the spinal joints, especially around the top segments of the neck, or simply can be exacerbated by joint manipulation/mobilisation. Therefore, all forms can be either a relative or an absolute contra-indication to care thus X-rays must be taken of the joint prior to commencing any treatment methods for arthritic conditions. Is Osteoarthritis an Age-related Process? The short answer to this is no, osteoarthritis is not an age-related process. It is documented in the medical literature that 80% of people over 50 years of age will have evidence of arthritis on x-ray4. However, this does also mean that 20% of the population in this age group have none at all. Also, a curious fact I have noticed in my years of clinical practice, is that many patients have arthritis in only one limb, hand, hip, knee or area of the spine and not in the other. If it were true that it is an “age-related process” logic dictates that if all the joints are the same chronological age, then all the joints should have the same amount of “wear and tear”. This is simply not the case and I am sure you reading this have seen, heard or even experience this phenomenon yourself. It is much the suspicion of some smart cookies that arthritis is actually an old injury that was never treated correctly, thus the resulting accelerated degenerative changes of one joint or the absence of the same process in another. Weightbearing joints, such as the lumbar spine, the hip and knees are common areas of “wear and tear”1. This makes perfect sense due to the nature of both gravity and locomotion on these joints, repeated loading of body weight and bending, lifting and carrying heavy objects (such as children and work tools etc) will cause metabolic changes within these joints. However, it is when a patient tells me “I have it in my right knee only” is when the alarm bells begin to ring out. For unless your right knee is older than your left, this makes zero sense and therefore my thoughts go to a previous injury to the right knee that the patient may have forgotten about. In our next blog, we will be discussing specifically spinal arthritis and disc disease as this is an area of interest and importance to most patients who present at the clinic. For more information about other areas that may contribute towards arthritis, our Smoking blog post has some detailed information, my colleague Dr John Bergman has some interesting videos on this topic and how Chiropractic along with diet and lifestyle modification can help. Yochum TR, Rowe LJ. Essentials of Skeletal Radiology. 2nd ed. Baltimore, MD: Williams & Wilkins; 1996. Beck RW, Holt KR, Fox MA, Hurtgen-Grace KL. Radiographic anomalies that may alter chiropractic intervention strategies found in a New Zealand population. J Manipulative Physiol Ther. 2004;27(9):554-559. doi:10.1016/j.jmpt.2004.10.008. Murray MT. Gout. In: Textbook of Natural Medicine. 4th ed. St Louis: Elsevier; 2013:1400. Pizzorno JE, Murray MT. Osteoarthritis. In: Textbook of Natural Medicine. 4th ed. St Louis: Elsevier; 2013:1651.